After reading the spring boot reference in november, I wanted to know more in depth knowledge of spring data. 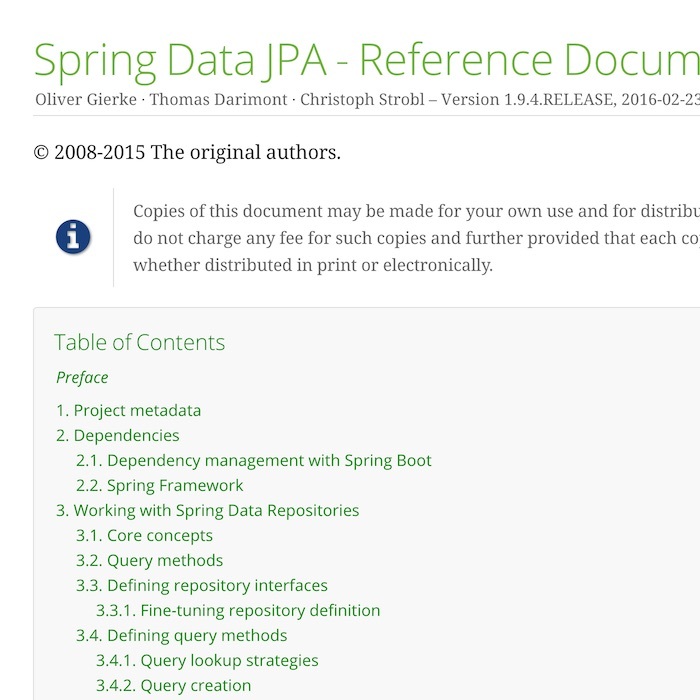 That's why I read the official spring data jpa reference. Even though the _ (underscores) look ugly ;). At the end checkout the Appendix C: Repository query keywords, to see what magic words you can use in your Interface definitions. Also Appendix D: Repository query return types is very interesting - you can use even Stream<T> and Future<T> entities in the interfaces! With 69 pages it does not go too much into detailed use cases, but provides a sufficient and basic understanding what is possible with spring data and what's not. I would suggest everyone to check that out, before digging deeper into special spring data implementations like elasticsearch or mongodb. Great work @olivergierke and contributors. There seems to be a good book on that topic, too: Spring Data (O'Reilly Media) - that might be my next.